Gala Fairydean Rovers, in red, enjoyed a fine result against the Lowland League champions (picture by Brian Sutherland). 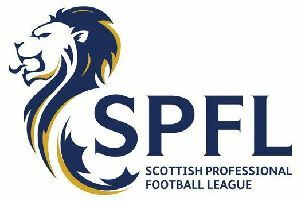 Lowland League leaders Spartans crashed to their first defeat of the season against a spirited Gala FR outfit at the Netherdale 3G Arena on Saturday. After a disappointing display in midweek against Gretna 2008, the home side were determined to make amends and, in the end, were good value for their victory. But there was a moment of controversy five minutes from time when Spartans sub Jack Smith appeared to have tied the scores at 2-2. With the Spartans players back in their half, referee Michael Addy consulted assistant referee Gary Callachan and the decision was made to disallow the goal for offside. It was a lifeline Gala FR grabbed with both hands and, in the final minute, Gala FR sub Tommy Patterson ensured the three points with a 20-yard free kick into the bottom corner of the net, eluding Spartans ‘keeper Blair Carswell. On an afternoon of glorious autumn sunshine, both teams carved out chances in the first half, with the best falling to David Greenhill from the visitors, who struck the crossbar with a thunderous shot. Spartans took the lead in the 42nd minute when Jamie Dishington cut in from the right flank, on to his left foot, and his shot took a deflection off Gala FR defender Ricky Miller, on its way past keeper Patrick Martin. But Gala FR stepped up a gear after the interval and were back on level terms in the 53rd minute, when skipper Sean McKirdy fired home from 20 yards. On the hour mark, the home side were on front when on-loan Hibs striker Ruari Paton fired an angled shot past the stranded Carswell. Spartans pressed for the equaliser and they thought they had got it late on, only to be deprived by the offside decision. Gala FR had the last word through Patterson’s free kick to cap an impressive display and a confidence booster ahead of the Scottish Cup tie against East Stirlingshire on October 20. Dean Shanks’ men have a free Saturday this weekend to help them prepare. Gala Fairydean Rovers: Martin, Johnson, Main, Donaldson, Miller, Smith, Cunningham, Watson, Paton, McKirdy, Baxter. Substitutes – Ainslie, Mitchell, Patterson, Morris, Amos.